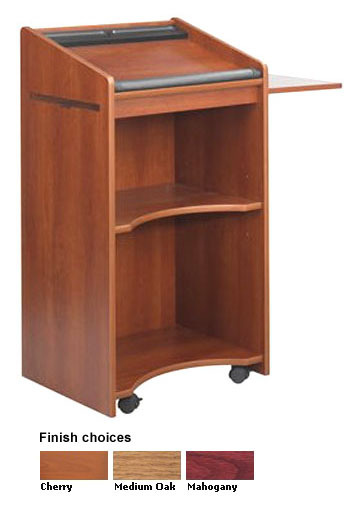 This sturdy mobile caster has four swivel casters (2 locking), is constructed from quality 3/4" furniture-grade wood. It is easy to assemble with cam-lock fasteners. It comes in choice of three finishes:cherry, medium oak and red mahogany. (lecturn depicted is mahogany.) Dimensions: 25-1/4" W x 19-3/4" D x 46" H.
This sturdy mobile caster has four swivel casters (2 locking), is constructed from quality 3/4" furniture-grade wood. It is easy to assemble with cam-lock fasteners. It comes in choice of three finishes.